This rendering shows affordable housing known as The Paddock at Grandview and is overseen by MDHA. It faces its next debate — likely to be intense again — at the Metro Council. The moment for decisive votes comes after nearly a year of study and meetings — and one prior vote by the Planning Commission that shot down the first draft of inclusionary zoning. “Last time this was here, I’m sure you’ll recall, everybody hated it,” Councilman Bob Mendes told the commission. He was referring to a three-hour pile-on in January when commissioners, housing developers and even affordability advocates blasted what they described as a convoluted and hurried proposal. The commission sent “Bill 133” back for more work. As rewritten and streamlined, it now says that apartment developers who ask for special permissions, or “entitlements,” must, in exchange, build affordable units. A detailed chart (still simple compared to prior versions) outlines how many units they would need to set aside, and at what income levels. 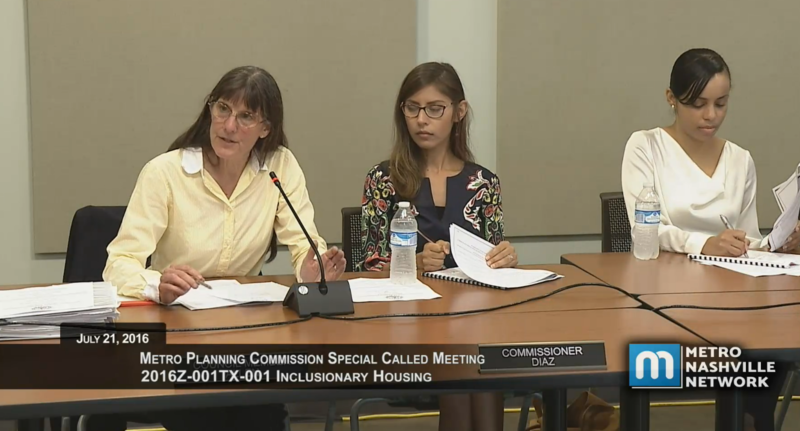 In more than 75 letters to the Planning Commission, a ratio of roughly eight to one were in favor of inclusionary zoning. But those few opposition letters represent big organizations — power players like the Nashville Area Chamber of Commerce and the trade groups for realtors and apartment managers. Supporters of inclusionary zoning say it still won’t spur enough affordable units, but described it as one tool for a city that has several proposals in the works. “While it may not be as bold as we advocates would have hoped, without question, in the sake of moving the needle forward in our community on a crucial issue, we completely endorse it and urge you to do the same,” said Avi Poster, with A Voice for the Reduction of Poverty. Opponents flatly disagreed, saying inclusionary zoning will burden developers, deter investors and potentially make housing costs worse. Their economic argument, voiced by developer and Vanderbilt University Professor of Real Estate Marty Heflin, is that Nashville’s problem has been a shortage of apartments. Now that as many as 26,000 units are in the pipeline, Heflin said rates would naturally come down by as much as 10 percent in the next 18 months. Councilwoman Burkley Allen, left, argues in favor of inclusionary zoning. Both sides made overtures about the future. But the lead sponsor on inclusionary zoning, Councilwoman Burkley Allen, also looked backward. She spoke of the dozens of meetings that brought the policy to its current form, and to the other Metro policies that she says have failed to encourage construction of affordable units. She said developers have been able to request extra density, avoid requirements for including parking spaces, and pay low fees compared to other cities — but haven’t served low-to-middle income residents in return. In addition to the policy specifics, another pervasive question was one of timing: Did the Planning Commission need to act, or would a deferral allow for further discussion and compromise? Council members Sheri Weiner and Colby Sledge disagreed. “Disapprove this bill and consider it incomplete, so that we can go back to the drawing board for a little bit longer. There’s no rush,” Weiner said. Planning commissioners like Lillian Blackshear sensed the urgency. “It’s starting to feel a little irresponsible, to me, as a commission, to not have acted on this yet,” she said. Commissioner Stewart Clifton said it was time for new rules after years of allowing pricey redevelopments that offered little public benefit in return. “Growth has been good for us, however …we have for a number of years inadvertently — through many neighborhoods and through a lot of downtown and Midtown rezonings — eliminated possibilities for future affordable housing and for future workforce housing. Like in January, the debate lasted another three hours, but commissioners passed inclusionary zoning this time, by a wide margin. Nashville’s new affordable housing proposal was dealt a blow Thursday night after three hours of criticisms from poverty advocates, developers and planning commissioners. In the end, the commission refused to endorse the affordability blueprint offered by planning staff. Affordable housing — it’s the subject Nashvillians cannot hide from in the past year, with widespread thinking that something should be done about rising prices and changing neighborhoods. Now, after months of study, several proposals are on paper and ready to be debated. Metro Nashville will have more money than ever this year in its Barnes Fund for affordable housing. And the jump — from about $1 million to more than $5 million — has officials reevaluating how the money can best be spent. About 50 of Nashville’s most important players in housing development heard an urgent message last night: The city can’t delay in creating more affordable units.